Keeping pace with the popularity of the beautiful destinations in the state, hotels and resorts have come up all over Himachal Pradesh. Himachal Pradesh Tourism board has a number of Hotels in Himachal, which cater every segment of traveler that comes to the state. These hotel Himachal all are equipped with modern day facilities and throughout the year they offers several Holiday packages and Tour packages. Several major business houses and prominent names in the hospitality industry like Oberoi-Cecil, Radisson Group, Toshali Resorts Intl, Club Mahindra, Sarovar Group, & Holiday Inn etc. has set up units in the major destinations of the state adding to the quality and variety of the options available. Toshali Royal View will remind you of the Raj, Outwardly. The resort justifies its name with lavish accommodation, modern amenities and endless entertainment. The experience of the heavenly heights starts the very moment when you check into the hotel. The warm welcome and hospitality of the resort touches the soul of its guests. Hotel booking in Shimla is not a big deal. If you collect information on best hotels in Shimla, no doubt you will find a wide range of luxury hotels, deluxe hotels, budget hotels, 3 star hotels and resorts in Shimla with all modern amenities. But to make your trip to Himalayas a lifetime memory, a perfect accommodation in Shimla is the one which provides a perfect heavenly ambience. Toshali Royal View is one such ultra-deluxe resort. All the rooms of this luxury resort in Shimla overlook the dense pine valley and snow-capped Himalayan range on the either side. Excellent accommodation, complete with all modern amenities and endless entertainment, raises the Toshali experience to heavenly heights and gives the guests the experience of a life time. Just 24kms from bustling Shimla Mall Road, a very exclusive luxury experience awaits visitors. 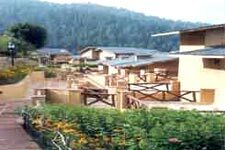 Set in 40 acres of landscaped gardens, apples and cherry orchards, SHILON RESORT is located at a height of 7200 ft above sea level. Shilon Resorts provides 50 spacious cottages laid out over 40 acres with the multi layered design giving an idea of larger space and more privacy to the guests. The Shilon is situated about 24 km from Shimla on the Shimla-Kufri road at 7200 feet. This resort around Shimla provides excellent views of the pine forests in the valley and snow peaked mountains including Kinner Kailash, Churchandni peaks and the Shivalik ranges in Himalayas. Apple orchards and other fruit trees abound in the resort giving the place a unique style and look.